White Plains, NY (October 8, 2018) – A serious crash involving a motorcyclist was reported to have taken place during the early morning hours of Monday, October 8. The crash was reported at approximately 12:18 a.m. after a motorcycle rider became involved in a collision with another vehicle. Police immediately arrived along with emergency medical crews to the scene of the crash that occurred in the westbound lanes of the I-287 in the city of White Plains. Emergency medical personnel quickly transported the seriously injured motorcycle rider to Westchester Medical Center. The victim was tragically pronounced dead at the hospital a short time later. There were no other injuries reported in the crash, and no details were provided pertaining to another driver. The name of the deceased has been withheld in order to allow time for the notification of the family. Police are currently investigating the events that led to this accident. We wish, above all else, to offer our earnest sympathies and utmost compassion to the loved ones of the victim who lost their life during this tragic time. 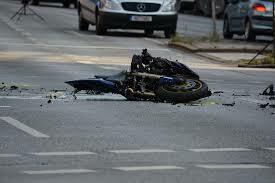 A New York motorcycle accident will frequently result in desolation, and we sadly understand that very well. The investigation will focus on several possible reasons for this accident such as medical issues with the victim, intoxication, excessive speed, mechanical failure, or the involvement of another party. In the event that the other driver believed to be involved is found responsible, there will likely be grounds for a New York personal injury claim available to the family members of the victim. Similarly, if mechanical failure is at fault, the victims’ family may have a claim against the manufacturer. The imperative thing to realize is that you may have rights moving forward. We here at Hach & Rose recognize the absolute devastation that comes from the unforeseen loss of a loved one. During such a time, the emotional and financial toll can be enormous, and we are here for you to offer our experience in dealing with negligent parties and other entities. If you have lost a loved one in a New York motorcycle accident, please don’t hesitate to call us at 212-779-0057 today.